Paeonia (pay-oh-nee-ah), peony; Paeoniaceae Family. Popular, long-lived hardy perennial of both herbaceous and shrubby tree form. It is grown in the Northern Temperate region for its showy single or double blooms that appear in late May and early June. Foliage of the herbaceous types is decorative, with compound leaves that last well until the first frost and are erect on strong stems. In herbaceous varieties, the entire plant gives a bushy effect ranging from1 1/2 to 3 1/2 feet in height. Five wild species, all from China, account for most of the hybrids available today. Japanese and single-form peonies have large flat blossoms with a mass of stamens at the center. Double forms produce heavy ball-like heads. 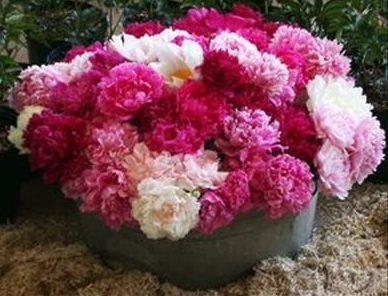 For well over a century, peonies have proven themselves to be beautiful yet tough, low maintenance perennials. In the garden, peonies require little attention, making them a perfect choice for beginning gardeners and busy moms. A sunny or partly shady site is ideal for garden peonies. Protection from afternoon sun and from harsh winds will help to prolong the lives of the exotic flowers. Peonies will perform best in well-drained, evenly moist, rich soil with a pH near neutral. Though peonies may be slow to develop their deep, substantial root system, peonies can live 50 years or more. Use peonies as border plants or mass planting; plant in rows to create a hedge. Peonies exhibit a high degree of drought tolerance (once established), and are pest, disease and deer resistance; plus their fragrant flowers are great for cut and dried flowers. PLANTING: Space plants 3 ft apart in full sun or light shade, the latter being preferable in southern zones. The ideal soil is rich and moisture retentive, but well drained. Dig a hole 2 feet square and deep, mixing the soil with liberal amounts of humus or well-decomposed compost, along with some bonemeal. Set the root clumps in the hole so that the 'eyes' or growing points are covered with no more than 1-2 inches of soil. Do not plant too deeply or your peony will not prosper. Firm the soil around the plant after planting and water well. For more information, click on Growing Peonies. MAINTENANCE: It is vital that these plants be kept well watered during their growing season. As peonies are heavy feeders, fertilize each spring with a high phosphorous fertilizer after growth has started. When cutting, remove as little foliage as possible, since the leaves are necessary for plant growth and vigor. Remove spent flowers and, in the fall, cut back dead foliage. Established plants prefer not to be moved. In situations exposed to heavy winds, staking or a plant support hoop may be necessary.